...But I think these philosophical arguments against a right to move are ultimately unconvincing. They fail to give sufficient weight to the essential interest that all of us have in being able to live, love, study, work and settle without being restricted by the coercive and often violent imposition of borders. In the context of massive inequality, the current border regime is even more unjustified, akin to the arbitrary and anti-human character of a global caste system. Do we have the right to keep the jobs we were trained for? On the first question, I’ll offer a bold Maybe. Kennan’s core assumption is that immigrant workers with a given level of education and (I think) experience will have the same productivity as already resident workers. So a move from a low productivity country to a high productivity country produces a big increase in their effective labor capacity. That benefits those workers, but also produces a shift in global income from labor to capital since the supply of labor has increased. "with a given level of education and (I think) experience will have the same productivity as already resident workers." Given the opportunity, immigrants will outpace them. Over trout in Princeton, the laureate says he’s glad the Clinton era is over and it isn’t only Trump voters who feel ‘excluded’. ...Deaton is gracious about my bind and offers some advice. It helps that he looks like he has been plucked from central casting for emeritus professors: requisite tweed jacket, jumper and wire-rimmed glasses; white hair just unkempt enough to give a flicker of Ivy League eccentricity. He is also wearing a blue bow tie with vivid red stars that once belonged to one of his mentors, the late Richard Stone, fellow Nobel Prizewinner and the godfather of British national accounts. Mistral is bright and airy despite the rain outside, and filled with music, cheer and the clanging of cutlery and plates. The noise forces us — two slightly rumpled large men — to lean across the small table to hear each other. I can’t help thinking that we are also, in the parlance of 2016, two “metropolitan elites”, sipping a smooth Oregon pinot noir and pondering death, pain and Donald Trump. I can’t help thinking he's right. This illusion is punctured by any recognition that there is a large societal dividend to be distributed, and that the government can distribute it by supplementing (inadequate) market wages determined by your (low) societal marginal product, or by explicitly providing income support or services unconnected with work via social insurance. Instead, the government is supposed to, somehow, via clever redistribution, rearrange the pattern of market power in the economy so that the increasing-returns knowledge- and network-based societal dividend is predistributed in a relatively egalitarian way so that everybody can pretend that their income is just "to each according to his work", and that they are not heirs and heiresses coupon clipping off of the societal capital of our predecessors' accumulated knowledge and networks. "Speaking as a card-carrying neoliberal and as a proud member of the Rubinite wing of the Democratic Party,..."
"a welcome and tasty and affordable simulacrum of the tomato-eating experience." 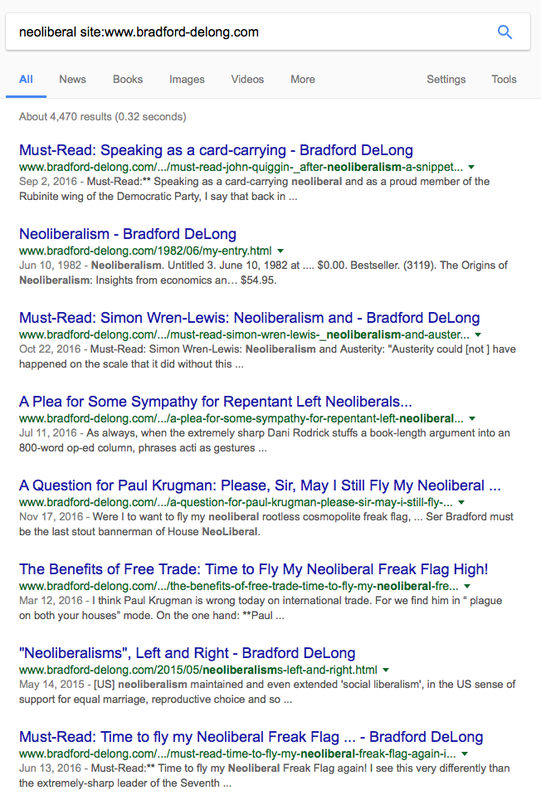 new tags for Deaton, DeLong, Quiggin, Noah Smith, also Dani Rodrik. It's easier than linking and relinking to earlier posts, and I'm not going to make a tag for economics.